Unless you eat like a hunter-gatherer, grass-fed butterfat is an irreplaceable part of a healthy diet, argues the Weston A. Price Foundation. Studies show it protects against heart disease, cancer and bone disease. Unless you eat organ meats, fish eggs, bugs or blubber — items most civilized people find repulsive — you are missing out on essential nutrients that can be found only in grass-fed butterfat, argues the “politically incorrect” nutrition organization, the Weston A. Price Foundation. But butter has been worshiped for its life-sustaining, health-promoting properties for millennia, she argues. “When Dr. Weston Price studied native diets in the 1930’s he found that butter was a staple in the diets of many supremely healthy peoples,” Fallon writes. Heart disease was rare in America at the turn of the 20th century, Fallon notes, but between 1920 and 1960, it became America’s number one killer. During the same period, butter consumption plummeted from 18 pounds per person per year to four. “It doesn’t take a Ph.D. in statistics to conclude that butter is not a cause,” Fallon writes. In 2015, American butter consumption reached a 40-year-high of 5 pounds per person per year, Fallon noted. New Zealanders consumed 24 pounds! Meanwhile, only 1 in 20 adults in New Zealand has heart disease, compared to 1 in 4 Americans. That means New Zealanders consume 5 times as much butter as Americans and have a fifth of the heart disease. A 2016 Harvard meta-analysis of studies found no association between butter and heart disease and a 1991 survey by the Medical Research Council showed men eating butter had half the risk of developing heart disease as those using margarine. This is because grass-fed butter has nutrients that protect against heart disease and other diseases, Fallon says. Vitamin A – Vitamin A is needed for the health of the thyroid and adrenal glands, both of which play a role in maintaining the proper functioning of the heart and cardiovascular system. Heart abnormalities and larger blood vessels occur in babies born to vitamin A deficient mothers. “Butter is America’s best and most easily absorbed source of vitamin A,” Fallon says. Lecithin – Lecithin assists in the proper assimilation and metabolism of cholesterol and other fat constituents. Antioxidants – Butter also contains a number of anti-oxidants that protect against the kind of free radical damage that weakens the arteries. Vitamin A and vitamin E found in butter both play a strong anti-oxidant role. Butter is also very rich source of selenium, a vital anti-oxidant–containing more per gram than herring or wheat germ. Cholesterol – Butter is a great dietary source of cholesterol, which — surprise — is actually a powerful antioxidant that floods into the blood when we take in too many harmful free-radicals, such the damaged, rancid fats in margarine and highly processed vegetable oils, Fallon says, citing a 1984 study. In the 1940’s researchers blamed saturated fats for cancer. They neglected to mention the “saturated” fat they used in their experiments was partially hydrogenated, the kind found in margarine. “So butter was tarred with the black brush of the fabricated fats, and in such a way that the villains got passed off as heroes,” Fallon says. Actually, many of the naturally saturated fats in butter have strong anti-cancer properties. Butter is rich in short and medium fatty acid chains that have strong anti-tumor effects, according to a 1986 study published in the Journal of the National Cancer Institute. Butter also contains conjugated linoleic acid, which provides excellent protection against cancer, according to a 1995 study published in Nutrition Reviews. The Wulzen or “anti-stiffness” factor is a nutrient unique to butter. Dutch researcher Wulzen found that it protects against calcification of the joints–degenerative arthritis–as well as hardening of the arteries. Unfortunately this vital substance is destroyed during pasteurization. Vitamins A and D in butter are essential to the proper absorption of calcium and hence necessary for strong bones and teeth. The plague of osteoporosis in milk-drinking western nations may be due to the fact that most people choose skim milk over whole. Ethnic groups that do not use butter obtain the same nutrients from things like insects, organ meats, fish eggs and the fat of marine animals, food items most modern people find repulsive, Fallon says. It suggests NZ increased butter consumption vs US is heart healthy. 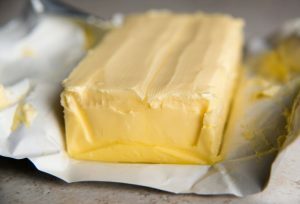 It references a harvard meta analysis that finds no link between butter and increased cardio vascular disease, however that same study says each 14g serving of butter consumed daily increases overall mortality by 1% and suggests butter, a concentrated source of saturated fat, is still a worse choice than sources of healthy unsaturated fats such as extra virgin olive, soybean, or canola oils. It also says butter does not lower risk of cardiovascular disease. recent studies from 2016 show vitamin A is important for heart development in embryos, but whether it has a role in maintaining heart health is unclear. The only statement made correctly by this article is that that grass fed butter is a good source of conjugated linoleic acid, which has anti tumour properties. Other sources are grass fed beef and full fat milk. The article also suggests the vitamin A and D are essential for calcium absorption. Vitamin D is essential to calcium absorption. There is no difference in the occurence of vitamin D between grass fed and grain fed butter. Now all you need to do is study and understand science and who funds the studies and last but not least who gets published. Hint: follow the money and you quickly find we are being lied to for profit. Saturated fat IS KING! It is essential for human health. Thanks buddy for clearing it up. Is not fresh raw goat milk as good as or better than butter? I don’t find butter to be a bad thing. Like most such things, too much of it isn’t good. I’ve been using butter most all my life and I’m 54, and have always, ALWAYS, had excellent cholesterol levels and a strong heart. I will say, I eat right – lean meats, organic veg and fruit, light on the grains but organic as well, and I exercise regularly. I prefer grass-fed animal products as that is what the animal naturally should be eating, but I don’t see the issue with grain fed unless the animals are given hormones or other such unnatural substances. I don’t use milk as it seems to bother my digestive system, but fermented products from milk don’t seem to be an issue. A small amount of butter has never bothered me. To me, it’s more about natural foods in their proper amounts and staying away from the processed and junk-laden garbage. Butter, like all such things, should be used in moderation, but I don’t think it’s a bad thing. It’s certainly better than trans-fats! Grain fed means feedlots means unhealthy white fat. It is a shame that when one writes articles like this the critics are not far behind.This article obviously isn’t interested in gaining profit from butter as it is readily obtained from stores and can be made locally..furthering the ideology or organic free range food. Unlike Canola oil,and other vegetable oils which require much processing making them possibly more toxic.Political activism is trying to decide for the public what we can and can’t eat.Perhaps these activists could also explain the rising cause of disease that the sugar and processed carbohydrate industry has caused over the last few decades.As I see it Pharmaceutical companies love ill people as much vitamin supplement companies love processed food addicts.There is much superiority that these people convey thinking it will protect them from illness.However there is far too much politics in food…and I feel that is the biggest disease. this article is an advertisement for a book, or are you not paying attention, it’s completely financially motivated! The industry of food allows this dependency to food. Butter is a fat. Fat clogs arteries and leads to all kinds of health problems. You do not need fat to eat a healthy diet. Please read Dr. Dean Ornish’s books and watch Fork over Knives on Netflix. Join the FOK Facebook group. Simply put…”grass fed butter” is healthier than “grain fed butter”. It doesn’t mean one should up their intake of it. Grass fed has nutrients that grain fed does not. Use moderate amounts and take note that “olive oil and canola oil” should not be used for high heat saute or frying. Use Ghee, peanut oil or a combination of butter and peanut oil. Butter burns but less likely to burn if you add oil to it. One should know that our brain needs cholesterol to function so never cut it totally out of your diet.